Directions: Stem & split brussel sprouts. 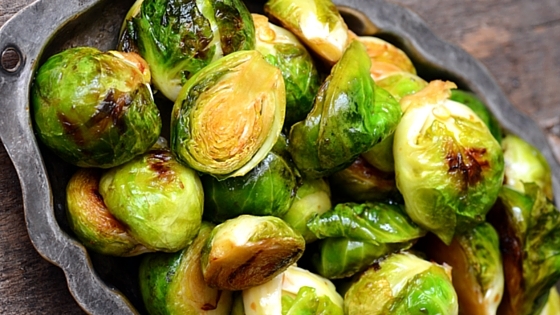 In a large bowl gently toss together the brussel sprouts, avocado oil, balsamic vinegar, salt & pepper. (You want to thoroughly coat all the brussel sprouts so they are slightly shiny and a golden color from the balsamic vinegar, but you don't want a lot of excess at the bottom of the bowl after thoroughly tossing.) Place in a 10 1/2 x 13 inch glass Pyrex pan or other large oven-proof baker. Bake at 350 degrees for approx 45 minutes, stirring gently every 15 minutes to ensure even cooking. (Note: the leaves that fall off will cook faster; to prevent these loose leaves from burning, try to keep the brussel sprouts compactly together and not loosely spread out.) While the brussel sprouts are in the oven, cook and chop the bacon & reserve. When the brussel sprouts are done (tender & golden brown) remove from oven and gently toss in the chopped bacon. Serve immediately. Enjoy!